Often viewed as just a piece of the ocean scenery, corals are sedentary creatures, forming colonies of various shapes and colors. However, on closer inspection, these little invertebrate animals are quite active, snatching food with tiny tentacles and fighting one another for territory. In fact, some people consider them to be fascinating pets. Though few and far between, coral enthusiasts exist throughout the world, caring for a corals in closely monitored saltwater tanks. They also propagate these animals by splitting them into separate colonies and encouraging them to spawn and grow. “They are insanely gorgeous, the colors they produce. Everybody likes a good fish tank, but everyone likes it more when there’s corals in it,” Megan Dunnock, president of the recently formed Coral Club at the University of Maine in Orono, said. 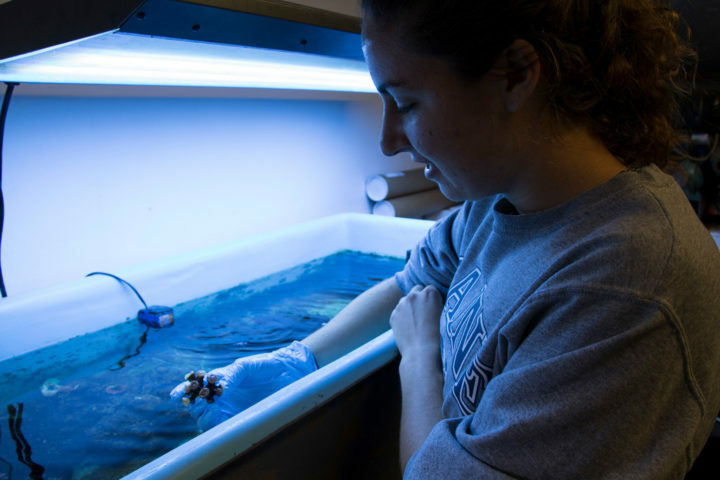 Established by a group of marine science students in 2017, UMaine’s Coral Club operates out of the university’s Aquaculture Research Center, where they’re responsible for a growing collection of corals. Green mushroom coral at the University of Maine Aquaculture Research Center in Orono. Related to anemones and jellyfish, corals are a group of animals that are individually called “polyps” and usually live in large colonies, which make up coral reefs. With hundreds of species living in oceans around the world, they differ greatly in shape, size and color, but they all have the same basic structure: a sac-like body and a mouth encircled by tentacles. Many types of corals use calcium and carbonate ions from seawater to build hard limestone skeletons for protection. And most coral have a mutualistic relationship with algae living inside their tissues. The coral provides the algae with a protection and compounds they need for photosynthesis. In return, the algae provides the coral with the products of photosynthesis — glucose, glycerol and amino acids — which the coral then uses these products to make proteins, fats and carbohydrates, and produce calcium carbonate, according to the National Oceanic and Atmospheric Association. University of Maine Coral Club members Nicole Ritchey (left) and Emma Jourdain inspect the club's growing coral collection at the Aquaculture Research Center on the UMaine campus in Orono. In recent years, the general public has become more aware of coral and their significant role in the ecosystem for one unfortunate reason: They’re dying. Several mass coral die-offs have been recorded over the past 20 years, including the widely reported 2016 die-off of about 30 percent of the Great Barrier Reef, the world’s largest coral reef comprising about 600 types of coral. In response, government agencies and conservation groups around the world are closely monitoring the world’s coral reefs to discover why they’re dying and what can be done to protect them. Now in its second year, the Coral Club has grown to 30 students who meet on a weekly basis to talk about recent coral-related news, share knowledge about caring for coral and developing fundraising events to support their growing collection. In this time, they’ve learned a lot about what coral pets need and what they don’t. They’ve also discovered that some species have surprising abilities and quirks. Caulastrea coral at the University of Maine Aquaculture Research Center in Orono. Corals require certain water salinity, temperature and constant water flow, as well as special lighting and a degree of tank cleanliness. They also require certain trace minerals in the water to grow, which can be provided with aquarium mixtures such as Reef Mineral Salt. In addition, some species of coral thrive with supplemental feeding. For example, the club feeds all their coral an algae blend twice a week. And they feed their duncan corals tiny pieces of shrimp. Also known as whisker coral or daisy coral, duncan corals are almost flowerlike, with large polyps that are round and surrounded by long, soft tentacles. Further, their colony grows on a central stalk in a bouquet-like arrangement. Other corals the club cares for are kenya tree corals, which grows roughly in the shape of a tre, its branches waving in the current; brain coral, which spreads over rocks in intricate patterns that resemble a human brain; and frogspawn coral, which looks like a mass of frog eggs. 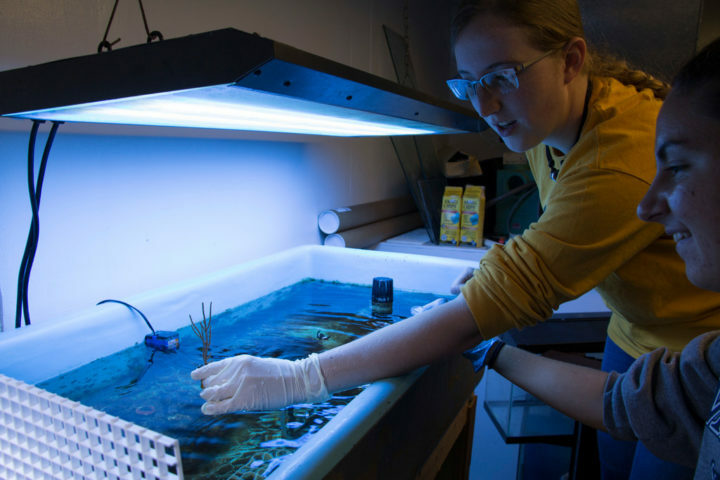 University of Maine Coral Club member Emma Jourdain inspects the club's growing coral collection at the Aquaculture Research Center on the UMaine campus in Orono. Though “cute,” frogspawn is one of several types of coral that has stingers that it extends to zap prey and neighboring coral that it deems too close for comfort. The club also owns a species of coral that contains and emits toxins that can cause life-threatening symptoms if people touch, inhale or ingest it. For that reason, club members wear gloves if reaching into the tank. “They’re not all friendly,” Dunnock said. 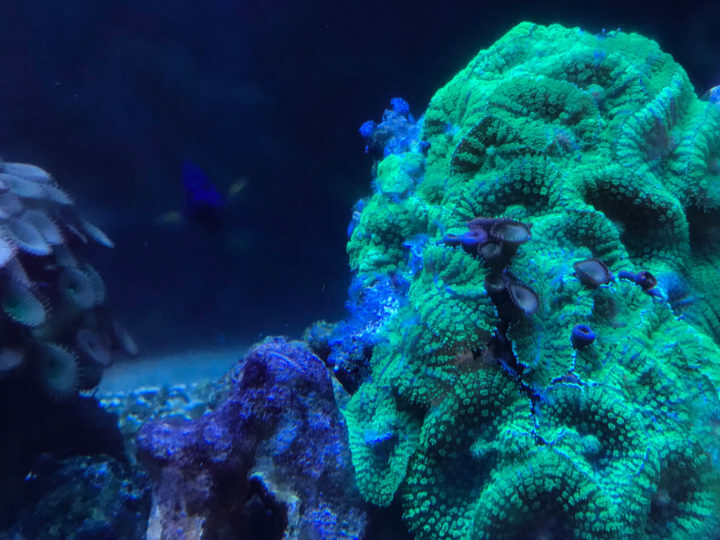 Working with a local coral retailer, Cultivated Reef in Orono, the club plans to continue to expand their collection, using it to educate fellow students and raise awareness about the importance of these mysterious ocean creatures. To enjoy coral as a pet, the first thing you’ll need to do is set up a specific saltwater tank that has temperature control, water flow and specific lighting. 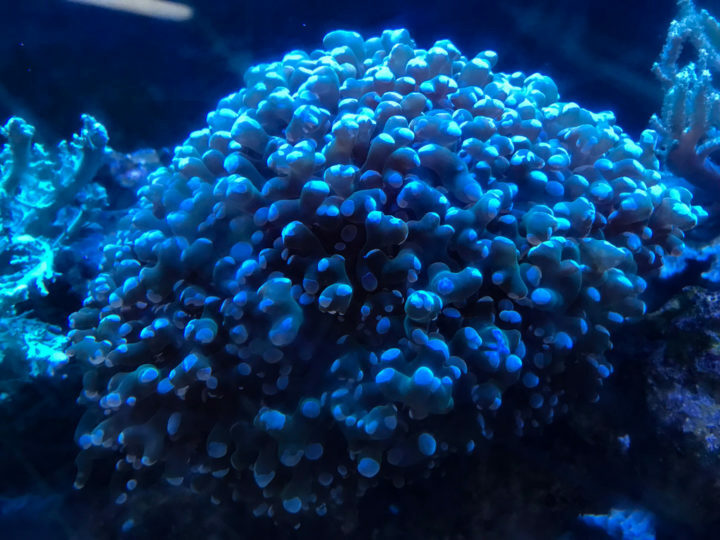 To create the optimal environment for your coral, you could work with a local pet store and consult online coral dealers, many of which offer customer support. There are also online resources for setting up aquariums, such as seasky.org. And there are books on the topic, such as the 2017 book “A ReefBum’s Guide to Keeping an SPS Reef Tank: A Blueprint for Success” by Keith Berkelhamer, a reef tank hobbyist for over 25 years. You’ll also want to do plenty of research of what type of corals you want to keep, considering each species has different needs. For example, some coral species like high water flow, while others do not. Some need more light than others. And some require specific food. Turnier suggests the forum on reef2reef.com, which is free to join and has a large active membership. Frogspawn coral at the University of Maine Aquaculture Research Center in Orono. Once you have the tank set up and the coral selected, you can purchase what’s known as “frags” (short for fragments) of the coral species from well-established coral dealers, such as World Wide Corals. These dealers know which corals are protected under international, national and state environmental laws, and if required by the state the state they operate out of, they may have a license for importing coral and selling it to the public. You can also learn about and purchase coral, aquariums and gear at coral expos, such as Reef-a-Palooza, America’s largest saltwater aquarium show, hosted annually in Florida, New York, Illinois and California. 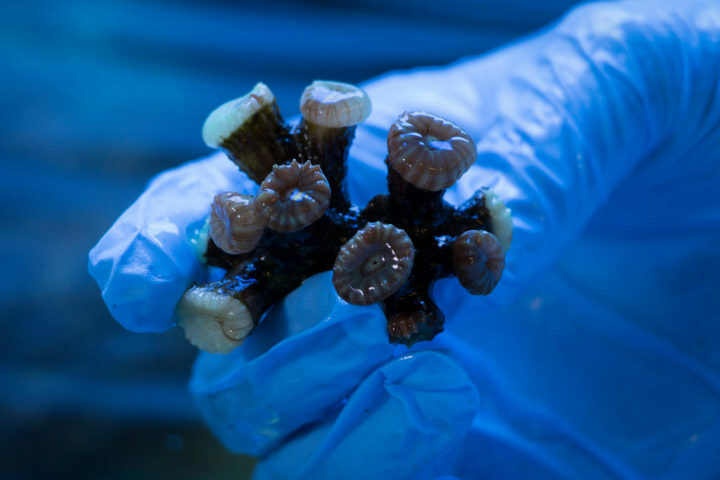 “[The hobby of owning coral] is absolutely growing,” Turnier said. “You can see from the attendance of these trade shows.